How much does it cost to adopt a bird from NEAR? Food -- a lifetime on seeds for a bird is like a lifetime on cupcakes for a human... they taste good, but provide little enrichment. In the rescue we feed all our birds Zupreem and Harrisons pellets, along with fresh fruits and vegetables. While the cost for much of a bird's diet shouldn't be prohibitive, it needs to be taken into consideration as part of the total cost of owning a bird. You will need a cage -- sometimes we have cages available and if we have an appropriate one at the time you adopt, you are welcome to it, however many times the birds will not come with a cage. Cage can range from a few dollars to over a thousand. Toys -- birds are extremely smart and easily bored. They need physical and mental enrichment. Apprpriate toys must be purchased and replaced frequently. For some birds the cost can be as much as several hundred dollars per month. 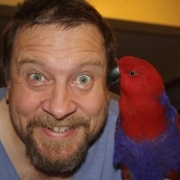 Medical care -- Avian veterinary science has come a long way in just a few short years, but it is still not highly evolved and it can be VERY expensive. It is unusual to leave an avian vet's office without at least a couple hundred dollar bill. If extensive testing is necessary to diagnose an illness, the costs can skyrocket. Can anyone adopt a bird? The short answer to this question is, "yes and no." While we strive to effect an adoption for every adopter who comes to us, we are also very committed to making sure we match each adopter with the right bird. This can sometimes be one of the more difficult aspects of the adoption process. While nearly anyone can be provide a healthy, happy home for a parakeet or cockatiel, some of the larger birds -- especially the older birds that are set in their ways and/or have been neglected or abused -- must be matched with a family that has the right amount of experience to be a successful guardian for a more difficult bird. NEAR always reserves the right to refuse an adoption based on the experience level of the adopter. What's up with the home visit? Not as much as people think. The home visit is an integral part of the adoption process, but it's not a matter of us wanting to go to your house and pass judgment or tell you how horrible a housekeeper you are. We do it for a few reasons. First, we do want to make sure we are not adopting a bird out to a dangerous home -- to a hoarder or a breeder or someone who has such a disregard for their own personal safety and well being that it would be impossible to believe they would do better with an animal. That sounds tough and blunt, but it is what it is. Beyond that however, we don't care so much how you live or what your decorating taste might be... we just want to be sure the bird will be safe in your home. Also, we find more often than not that people have all kinds of questions about the cage, the location of the cage, toy placement, etc. and there's no better time or place to handle those kinds of questions than the home visit. It usually takes ten minutes or less -- we have you read and sign our adoption contract, answer any questions and then we are on our way.